The Rebel Sweetheart. 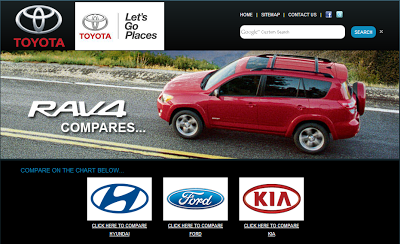 : Compare and contrast with the Toyota Comparison Site. Compare and contrast with the Toyota Comparison Site. So you've finally made the decision to retire your old car and get a new one. Not only have you set your heart into it, you've set a budget for the purchase, too. Now all that's left is to decide which brand and model you are getting. With many different automobile brands and car models in the market today, narrowing the choice to just one can be pretty tough. But with this car model comparison app found in the Toyota Cost of Ownership website, the daunting task of choosing which car to buy is made a lot easier. For every Toyota car model featured on the homepage comes a comparison graph that allows you to see how Toyota cars fare against its competitors. Simply click on a Toyota car model and you will be routed to a page containing the specifics of your chosen car model (in this case, the Rav4), a comparison graph featuring the different automobile brands, and a CF (that's commercial film) for your viewing pleasure. Also contained in that page is a link to yet another page, where you can view the special offers for that particular car. There are several lease options available if you're ready to purchase, or you can request for a quote for other possible payment schemes. Other inquiries can also be made on the said page, where you have the option to be contacted by a local dealer via phone or email. Toyota is also easy on the part and maintenance. That's a nice app! We already have a toyota car and favor it among others in the market but this app would be a great help to those who wants to buy a new one. i do prefer toyota always as a car.It is a hardy car with a very nice pickup as well.